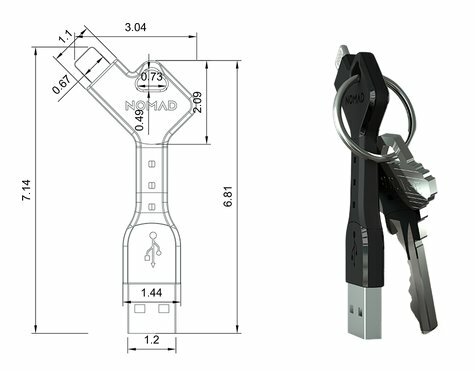 I've seen a bit of buzz on the Internet regarding the revolutionary Nomad Key - a USB cable that fits snug on your keyring; but seriously? Isn't this a step in the wrong direction - technology has advanced so much lately to a point that cables should be moving to the obsolete state not promoted as the next best thing since sliced bread. So, let's review - what do we need cables for? Wireless charging, aka Inductive charging uses an electromagnetic field to transfer energy between the device and a charging docking station. The Palm Pre, a webOS device released in 2009 utilized inductive charging as have a number of android based devices - but while the cable is gone, they typically incur additional cost, longer charging times and wasted heat. Bluetooth has been a technology feature available in almost every mobile device and modern laptop or desktop (with a dongle) since it gained popularity since it's introduction in 1998 - but really only became useful with the v2.0 + EDR specification in 2004. Synchronization over TCP/IP is gaining popularity as well, especially with cloud based solutions. So why are we trying to patch an existing problem that has better solutions? At least in the realm of IoT - there is a lot of research on regards to ultra low-power micro-controllers or wireless power (ref: PSIKick and Rezence) and we even see Arduino style devices that have thrown away the cable completely and allow sketch uploading via low energy Bluetooth (ref: LightBlue Bean) - forget the hype, push for a better solution.